Readability Checkers, Hummingbird & Rankbrain, Oh My! 240+ wine bloggers from all over the world ascended on Walla Walla, WA this past weekend. The city was this year’s host of the Wine Bloggers Conference. This annual event brings together bloggers, writers, winemakers, geologists, journalists and more. They discuss the current state of wine media while exploring a particular area. This year, Digital Firefly Marketing was lucky enough to speak to a fantastic group of wine bloggers interested in learning more about how their sites rank in Google and learning how to use Yoast as an SEO and readability checker. Blogging is getting more and more competitive as niches discover that getting found on Google can lead to turning that hobby blog into a money maker. Wine bloggers, particularly, rely on press trips and writing assignments to explore what can be a very expensive endeavor—wine travel is not cheap! But how does one get their blog discovered? Social media is one place. Google is the other. And Google is King. Digital Firefly Marketing CEO and President, John Cashman, and Director of Content, Nancy Koziol presented on the final day of the conference. Nancy, a wine blogger and author was attending the conference anyway, but wanted to bring something of value to other wine bloggers. First, Nancy showed bloggers facets of good writing for web content. Then John dug into the technical side: how Google “reads,” “understands” and ranks content using spiders, Hummingbird and RankBrain. If you attended our session, first: thank you! Here’s a quick review of readability. Web content readability encompasses seven components. Being aware of them while you write helps you temper authenticity with rankability. Once you’re done with a draft make sure you look at how you’re doing using the Yoast plugin, Yoast’s online readability checker and Hemingway app. You don’t have to hit all of them, but an overall score of green is what Google wants. First, remember to use actual subheadings instead of just changing the formatting. Google can’t see! It reads the code to look for those tags and know what you’re talking about and how you’re structuring content. Use one H1 (Heading 1) with the keyword. Between headings try to stick to at or below 300 words. This divides up your content and shows people where to find what they’re looking for. U2 was reading a blog that didn’t use subheading. You’ll notice that’s an image up there. When I tried to include those repetitious sentences in this blog post it killed my readability. Google thinks it’s super spammy so be really careful with repetitious sentences, even when they sound awesome. Or make them into images. That’s a clever hack! 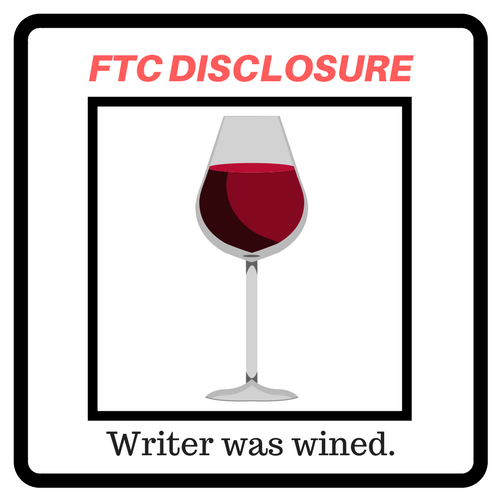 Wine writing uses technical terms. This automatically increases the reading level of blog posts. In addition, wine is beautiful: from vine to glass to palate, which means the writing is often very literary. Unfortunately, Google doesn’t appreciate this. And, honestly, many readers don’t either. 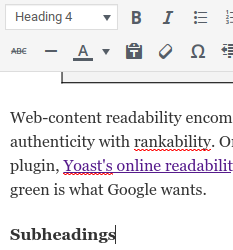 Yoast’s readability checker shows this in Flesch Reading Score which is tricky to figure out. Use Hemingway to quickly and easily find your reading level. 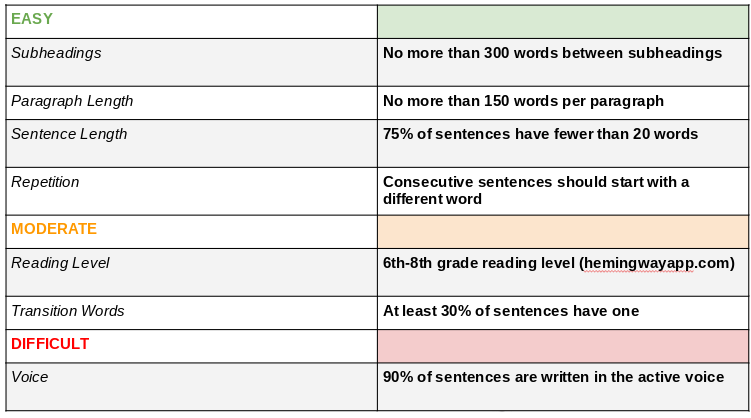 Don’t forget—high reading levels are fine if you reign in some of the other things Google is looking for. These are guidepost phrases and words that signify order, importance, number and comparison and contrast. If you are writing about a process, be sure to include what you did first. When you’re summing up a theory, feel free to use “in conclusion.” This helps your reader understand how your thoughts work together to make a cohesive piece. As John discussed, this is a biggie. Google uses Hummingbird to figure out how your content fits search queries It’s not able to understand the passive—”the wine was drank by us”—as easily as it understands the active—”we drank the wine.” Some passive voice is fine but make sure to use your favorite readability checker so that you don’t confuse Google. You don’t have to turn all of the lights green, but an overall green light is always a good idea. 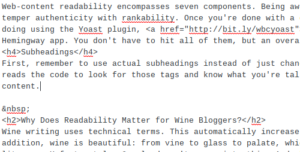 Why Does Readability Matter for Wine Bloggers? John and Nancy set out to help wine bloggers leverage the beauty of their blogs and writing by knowing how to assess how Google might feel about the writing. 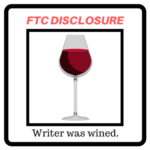 This means learning to write authentically while running their work through a readability checker to make sure it’s accessible to people searching for information about wine. Google sends its spiders out to crawl the entire internet. It scans the content on each page to create a map of the content. Since it can’t read it uses clues from the code to find tags. These tags and the words between them give Google a sense of what your piece is. Then it uses Hummingbird, which relies on readability, to figure out the context of your writing and how likely it is to match search queries. Making sure your content has good readability is the first step toward helping Google figure out content and rank your site both appropriately and high for related search queries. Digital Firefly Marketing loves to help. Many of you came up after our session and asked for our deck. It’s below for your reference and you can download it here. 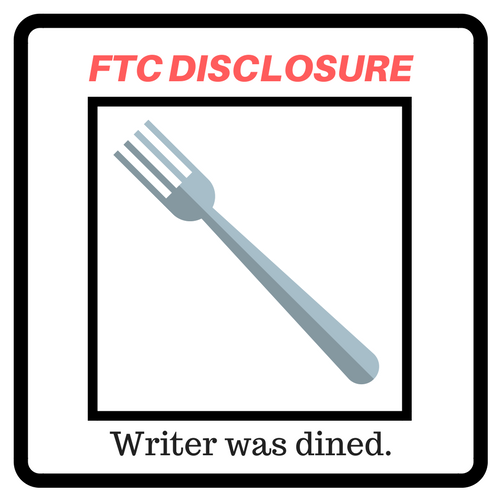 If you think bloggers in your network will find this helpful, please feel free to share on social and please consider tagging both Digital Firefly Marketing and Nancy! Feel free to email us or connect on Facebook if you want to ask specific questions. We are also happy to do a free content marketing audit for you.